Dogs will eat almost anything and everything that come their way including apparently harmless plant matter. But not all plant matter can pass through the canine digestive system without adverse effects – and marijuana is one of these plant matters. Here are the things that every dog owner should know about marijuana ingestion among canines. 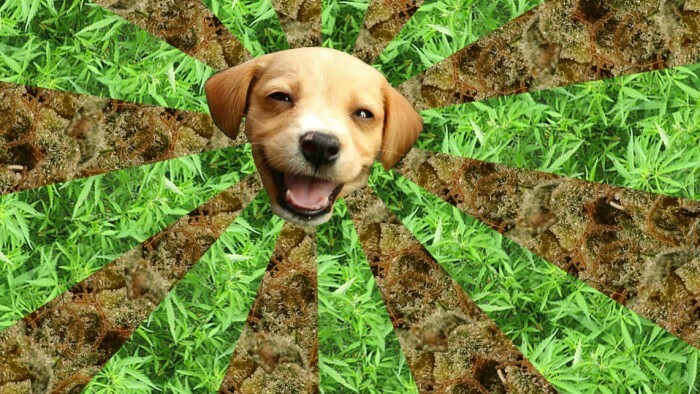 Veterinarians report an apparently increasing number of cases of marijuana ingestion among dogs. This can partly be attributed to the legalization of the sale of medical marijuana in many California cities, a move that has been equally praised and criticized for its impact on public health, among other matters. In California, dispensaries usually provide patients with valid prescriptions for medical marijuana with either the edible or smokable forms. And herein lies the issue where dogs are concerned – humans can become careless in leaving medical marijuana in locations that curious dogs can easily access. Marijuana poses a special challenge for veterinarians mainly because dogs can be exposed to the legalized drug but the symptoms of ingestion can be difficult to diagnose. Symptoms usually develop within a few hours after ingestion with many dogs developing signs of intoxication, which requires a visit to the veterinarian’s clinic for prompt and appropriate action. In mild cases, the dog will exhibit signs of lethargy, injected conjunctiva, altered response to verbal or visual stimuli. And changes in behavior. In moderate to severe cases, the dog displays signs of hypothermia, hypotension (low blood pressure), ataxia (lack of coordination in the voluntary muscles), anorexia (complete loss of appetite), diarrhea, dysphoria (vocalization), emesis (vomiting), ptyalism (hypersalivation), and urinary incontinence. Coma and death can also occur in severe cases thus emphasizing the importance of early detection, diagnosis and treatment; in many cases of death, the affected dogs were likely to have ingested medical grade THC (tetrahydrocannabinol) butter in its edible form. The vomiting is the result of the induced release of serotonin, among other feel good hormones, when marijuana is ingested. Marijuana has an anti-nausea effect but when consumed in large quantities in relation to the dog’s body, the vomiting reflex is stimulated. The affected dog may also exhibits overreaction to auditory and visual cues as well as difficulty in standing up and walking. Many canine patients may even lower themselves in to a sterna position down on the ground but in a staggered manner. Other symptoms especially with intoxication include mental dullness, slow heart rate, and dilated pupils. These clinical signs become observable within minutes to hours depending on the type and amount of marijuana ingested in relation to the size of the dog’s body. The symptoms can last anywhere for hours to days partly due to the storage of marijuana’s active ingredients in the affected dog’s body fat. It should also be noted that while dogs make up the majority of marijuana ingestion cases, cats are also affected. Pet owners who are on a medical marijuana prescription should be conscious about hiding their medications for the safety of their pets. What makes marijuana potentially fatal for dogs? Marijuana contains delta-9-tetrahydrocannabinol (THC), a chemical substance that causes the release of acetylcholine, norepinephrine, dopamine, and serotonin (i.e., neurotransmitters) in the brain’s cerebellum and frontal cortex. The increase in neurotransmitter levels leads to the manifestation of the clinical signs of marijuana ingestion. Veterinarians will not only consider marijuana ingestion. Other possible factors that affect the dog’s symptoms include ingestion of veterinary medications, recreational drugs, and prescription drugs, among others. Examples include stimulants like ephedrine and ephedrine-like compounds; methylxanthines in chocolate; ethylene glycol (antifreeze); amphetamines; nicotine; opioids; antidepressants; benzodiazepines; amitraz ; ivermectin; bromethalin (rodenticides); and alcohol (ethanol from rotting bread, dough and fruit). Marijuana edibles also contain several other substances that can adversely affect a dog’s health. These substances include carbohydrates, proteins, and fats, such as in the case of a dog ingesting a marijuana brownie filled with sugar, butter, or chocolate. Most dogs who have ingested marijuana usually recover with symptomatic and supportive care. The affected dog, however, should be provided with veterinary care as soon as possible since early detection and treatment will increase the chances for successful recovery. Note: One of the dangers of marijuana ingestion is the affected dog choking on its own vomit. Vigilance among pet owners is then a must. Treatment usually involves either giving activated charcoal to absorb toxins or inducing vomiting. In many cases, vomiting is first induced to clear the affected dog’s stomach followed by the administration of activated charcoal, which speed up the removal of toxins from the gastrointestinal tract. The canine patient can then be released from the clinic when it can hold down food and water. After release, many pet owners will treat their dogs to professional grooming services at Petsmart to release the tension brought by the traumatic experience.